Bringing a new puppy home is an amazing experience that will change your life, but some breeders may try and encourage you to take a littermate also. 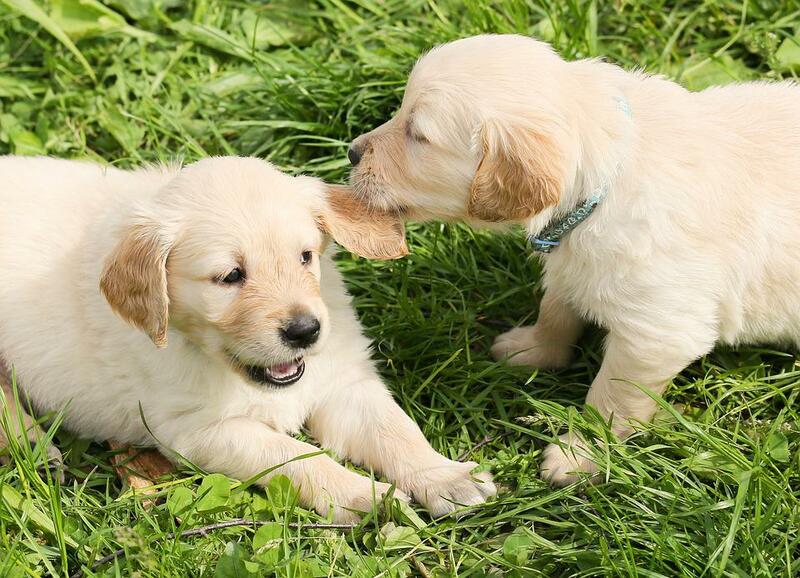 Some people would be able to handle such a commitment of two puppies, but littermates can come with a whole set of challenges you may not be expecting. In this article we will talk about what littermate syndrome is and how it can cause multiple behavioral issues littermates can develop. The failure to learn simple commands because the focus on each other. What if you already adopted a pair of littermates? Crating is a great habit to develop at a young age to get your puppies comfortable with them and it also provides them with a safe place that is their own within the house. Each puppy should have their own crate that they sleep in at night. For the first night, you can set the crates side by side, so each pup can start to adjust to being alone. Increase the distance between each crate incrementally until the crates are far enough apart that the puppies cannot see one another. Separate the training and playing sessions and work with each puppy individually so they can focus on giving you their undivided attention. This allows you to also become the leader to each puppy because you are the one giving the commands and the one in control of the treats. To keep you other puppy occupied have another member of the family work or play with that puppy in another room or in the backyard. If this wont work, you can use a treat-release toy with the other puppy while they are in their crate. Lastly, if you notice a major increase in issues, I recommend that you give one of the puppies to a friend or family member. Sometimes, this is the best solution for everyone involved. Littermate syndrome is not going to happen to every single pair of puppies that are raised together. Sometimes genetics play a role but the most important thing you can do is to make a commitment to your puppies and raise them to be well-socialized balanced adult dogs. If this might be too much for you to handle, just adopt one puppy, train it and raise it, until it is an adult and then add another puppy into your household. Over the years, Halloween has been a fun tradition highlighted with candies, trick-or-treats, themed parties and fun costumes. Indeed, Halloween is a fun time not only for kids and adults alike – but also for pets. But before you get carried away with fun and excitement, here are important things that dog owners should remember to ensure that you and your dog will have a fun and safe Halloween. Keep your dog comfy. While its fun to dress them up for the Halloween, make sure that your dog is comfortable wearing the costume. The costume they wear should not interfere with your pet’s movements, block their sight or limit their ability to hear and cause them trouble breathing. Avoid those costumes that contain tiny, dangling pieces or parts that can be easily chewed off or swallowed by your pet. You should also regularly monitor your pet when he or she is in costume. Have your dogs wear their costumes for rehearsals before the actual Halloween to see to it that the costume they wear fit them properly and get them desensitized to it. See to it that your pets wear a reflective collar for enhanced visibility. Having them wear dog tags with microchip, your name and contact information can also come in handy in case they get lost from the Halloween crowd. As always, it’s better to be safe than sorry. Have the list of important numbers saved through your contacts including your local veterinarian and animal poison control hotline. Prioritize visibility and choose the color of your pet’s costume wisely. Do away from complex and overly embellished costumes. 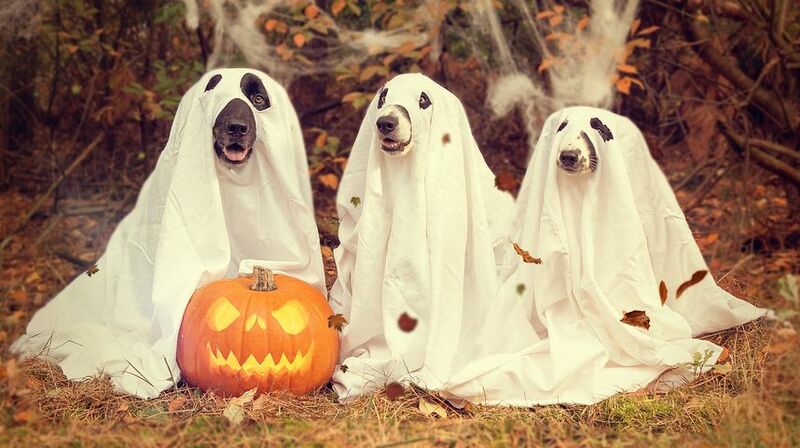 Choose simple yet creative costumes to avoid stressing your pets. If your pet is wary of wearing fancy costumes, a festive bandana can do the trick to dress them up. While we are in for sweet treats, candy bars and chocolates are dangerous for dogs. Be careful with cellophane wrappers and tin foils which can be harmful when ingested by your pets. Keep your Halloween decorations out of your pet’s reach, specifically those powered by electricity and lighted candles. When greeting trick-or-treaters see to it that your dogs won’t break out the door by keeping them leashed or putting them in a closed room. If your pet is not particularly sociable or may have the tendency to bite, have him or her stay in a safe hiding place during the hours of trick-or-treating. Watch out for those popular Halloween plants including pumpkins and corn used for decorations as they can cause stomach discomforts to your pets. For safety, ensure that your pets are housed safely indoors and avoid leaving them out in your yard during the Halloween. Glow sticks can add drama for the Halloween spooky night, however they contain liquid which may not really be toxic but may cause your pet to vomit or act strange once they accidentally chew on them. Reduce noises as much as possible. Doorbells and the screaming kids can easily stress out and even terrify your dog. Using a sound machine or TV can help drown off the noise or you can keep your dog in a quiet and safe room at the moment. Let’s face it: as a pet parent you are going to have to deal with more than a few messes in your time. When it comes to diarrhea nobody wants it smeared over their carpet or even in their kennel. It’s one mess that we would all rather live without! Fortunately for those of us who’s pets hate the V-E-T there are a few natural remedies for doggy diarrhea available that can help soothe the distress. The first step in any diarrhea cure is to find out what is causing it and avoid that thing at all costs. If you can prevent the problem happening then you won’t need a natural remedy at all! Obviously if your dog has a severe bout of diarrhea at any time in its life you should visit the vet. It will make them lose vital enzymes, salts and waters from their body that can leave them severely dehydrated if you don’t act. 1. Remove all food for 12 hours. 2. Make sure the dog has access to plenty of clean water. If needed, add chicken/beef broth or Pedialyte in addition to the water to help motivate them to drink. 3. Offer the dog a small portion of boiled white meat chicken (no bones or skin) and white rice. This can be the dog’s food until their stool consistency returns to normal. 4. If the diarrhea continues for more than 24 hours or your dog’s condition worsens at any time, call your vet immediately. Giving your dog a little dose of the natural probiotics found in plain yogurt will help to replace some of the vital stomach bacteria they have lost. Probiotics should be used in harmony for best results. Eggs can give your dog a natural protein boost that makes sure they are getting the nutrients they need in spite of the diarrhea. Be warned that this one is a hit or a miss. Sometimes an egg will just run straight through them. Plain canned pumpkin is a great choice to sometimes help with diarrhea! It contains fiber, prebiotics, and vitamins/minerals! You can 1-to-4 tablespoons of pumpkin to your dog’s food. Start out with smaller quantities to avoid adding too much fiber to your dog’s diet, if you are unsure, consult your veterinarian. Remember that if the symptoms persist you need to go to the vet. Also, if your dog has a pre-existing medical condition that causes the diarrhea then consult your vet about the best dietary changes to make. This problem is sometimes caused by a food allergy, so the solution should usually focus on diet first… it just never hurts to get a check up and make sure there is nothing else going wrong. Dog training is very important, but we often make mistakes because we are unaware of the error of our ways. Most of the times, these mistakes are not critical, but they do tend to slow down the process of the dog’s training. This causes frustration for the owner and confuses the pet greatly. Here are some mistakes commonly made in dog training, and how you can avoid them. You might think that training your dog for too long will produce better results, but that is not always how it works. Your dog might get bored especially if it is a young pup. You might start getting tired yourself and not pay attention to how the dog is behaving. Long sessions can be tiresome for both the owners and dogs. Short, fun, and fully engaged sessions are more effective because you can retain the dog’s attention better during this time. People often make the mistake of training their dogs at the same place, for example, their homes. Then they get confused when the dog behaves miserably at the park or in town. Many do not understand that dogs do not generalize easily, so you should try training them at different spots, so they can understand their commands better in a wide variety of environments. If you watch my training videos, you will see I am constantly in different areas with the same dog. Dog training takes time, technique and stamina. You need to be patient, and remain consistent to have a well behaved dog. People often lack insight and only react to the situation. Instead, you need to remain proactive, and train your dog regularly, to instill those good habits in your pet. As I say, “there is NO replacement for repetition.” Also, be proactive in training the dog for situations that you know they will find themselves in (distracted by other dogs, distracted by people, noises, objects, etc). It’s better to work on these things in a training environment so they are much easier to deal with in a real world environment. I always try to train the dogs for harder scenarios than they will actually deal with in a real world environment. Remember, the dog you are training does not care what you have going on in your life (a break-up, tired, stressed, etc). As I tell my trainers, “You chose to train the dog, the dog did not choose to work with you; therefore, YOU owe the dog everything and they owe you nothing.” Always make a conscious effort to be motivated, up-beat, and fun! If you find yourself (or the dog) getting frustrated, it’s time to take a break! Give the dog 100%! Consistency is KEY! There is no replacement for consistency. If you give the dog a command, it is imperative that you follow through 100% of the time. If the dog believes there is a loop-hole in your training system, they will certainly find it. If I tell the dog down, and they break the command five times, I will put them back six times. Only letting them up when “I” give them the release word. If you are training inconsistently, you should expect inconsistent results. In the words of a good friend of mine, mentor, and legendary trainer, George Hickox, “There are three things every dogs needs in order to be a champion: good genetics, good nutrition, and good training.” Depending on where you got your dog you cannot always control the dog’s genetics; however, you can control the other two! Look at your dog like a person; ensure your dog’s nutrition, hydration, and health is placed very high on your priority list! Having the ability to control two of the three most important things is huge! Do not take them lightly. A lot of people forget that the most important dog in the world is the one that’s right in front of them! Adjust your training, style, and methodology to whatever works best for the dog that is in front of you! Lastly, if you are ever unsure about a specific dog, behavior, or issue, ASK! Our world is filled with incredibly knowledgeable trainers, ask one or two of them for their advice! I am fortunate enough to have an entire contacts list filled with some of the best trainers in the country, I pick their brains every chance I get! Remember, it’s better to actually have the knowledge than it is to act like you do. When you learn, you become a better trainer and in turn, your dogs become better! It’s a win for you and it’s a win for the dog (the biggest win). CPR or cardiopulmonary resuscitation can save your pet dog’s life when done in a timely manner and following the right procedure. The procedure is basically a combination of artificial respiration and chest compression. Chest compressions will help keep the blood pumping in case your dog’s heart stops due to respiratory failure. Once the dog stops breathing, the vital organs including the brain and the liver suffer from deprivation of oxygen. In just a matter of three to four minutes brain damage can occur. Hence, prompt action is crucial. That said, every responsible dog owners must be armed with the knowledge on how to perform CPR on their pets in an emergency. CPR should only be performed when necessary and shouldn’t be done on healthy dogs. Otherwise it can cause physical complications or worst, fatal damages. Prior to doing a CPR, see to it that you assess your dog’s condition first. Check if the dog is still breathing. If it is, then you don’t need to perform a CPR. To check whether the dog is still breathing or not, check chest movements or place your cheek or hand up to their nose to feel for airflow. Determine if there might be an object that’s causing blockage on the dog’s airways. Open the dog’s mouth to check for any signs of foreign objects. Dislodge the object, should you see one, before conducting the CPR. On a flat surface, lay your dog on his side. Try to help open an airway passage by straightening your pet’s head and neck. Pull the tongue of the dog forward. Lay both of your palms near the dog’s heart on top of the widest part of the rib cage. Press down gently yet firmly. The goal is to make quick and rapid compression – compress, release, compress, release. Repeat about ten times every five-ten seconds interval. When doing artificial respiration the goal is to do artificial breathing of one breath after two to three seconds of interval. Start by sealing the lips of the dog. Place your mouth near the dog’s nostrils. Blow gently into the nostrils and check if for chest response – signs of lifting and expansion. This is ideally done for larger breed of dogs. To do this, compress the front part of your dog’s belly gently. Consider employing an abdominal squeeze by placing your left hand under your pet’s abdomen while your right hand rests on top of the abdomen. Check for signs of improvement on your dog’s condition. Stop at least every two minutes to check if your pet has already resumed normal breathing. Continue to administer artificial respiration until a veterinarian or help arrives. However, if after 20 minutes you notice no improvement with the dog’s breathing, you may discontinue the procedure as unfortunately, it has proven to be unsuccessful. Videos of dogs trapped in vehicles on hot summer days have gone viral around the world. The harrowing images have tugged at our heartstrings and deepened our public commitments to preventing these tragedies and helping our furry friends when they are in danger. But it’s important to know that dogs can also get heat stroke outside of hot cars. Whether they are lying outside on the lawn, doing obedience training, playing fetch at the park, or in a house without air conditioning, it is important for us to know the signs of heat stroke, so we can recognize the symptoms and prevent them from happening again. Heat stroke is also referred to as hyperthermia, and it happens when the body’s heat-dissipating mechanisms fail. It often occurs in high external temperatures and causes the body’s internal temperature to exceed 103° F. Consequently, the internal organs stop functioning properly. In dog breeds, it most often occurs in dogs with long hair or dogs with short noses and flat faces (brachycephalic breeds). When heat stroke strikes, it often happens when a dog is excessively exercised or unable to escape a persistent, high temperature. During the summer months, it is especially important to keep an eye on your dog and ensure they always have access to water. If you notice the following symptoms in your dog, they might have heat stroke: dehydration, panting, increased body temperature, excessive drooling, reddened gums, vomiting, uncoordinated gait, seizures, or difficulty breathing. Consult a veterinarian or animal hospital immediately. Recognizing and treating these symptoms is essential for your dog’s survival. Some suggested cooling methods include spraying your dog with cool water, wrapping your dog in cool, wet towels, fanning your dog, giving them water, or using evaporative cooling practices. It is also very important to use cool water, not cold water when treating your dog for heat stroke because cold water can shrink blood vessels which can prevent further heat dissipation. In less serious cases, a veterinarian will perform an exam after the incident. In most cases, however, dogs have to be hospitalized. Once they’re stabilized, tests for brain and organ damage are usually conducted. Old dogs and brachycephalic breeds are more likely to experience heat stroke, though it can happen to any dog. To prevent this serious condition from occurring, avoid excessively exercising your dog on hot days, avoid keeping them in rooms with low ventilation, take them out of the sun if it’s too hot outside, and have water available at all times. It may seem obvious to most people, but never leave your dog in a parked car. Cars have low ventilation and become hot very quickly. Additionally, you can learn dog CPR to save a dog should the need arise. In short, know the symptoms, and work to prevent heat stroke from happening in the first place. Dogs are an integral part of our families, and our love for them manifests in how we care for them. We can all take steps to prevent and recognize heat stroke to help save our beloved furry friends.